This drawing is interpreted as a mounted warrior “counting coup” on an injured white man who is bleeding profusely from the mouth and chest. The warrior is shown preparing to strike the man with a tree limb. The injured man is dressed in buckskin jacket, boots, scarf, and brimmed hat. Note the unusual style in which the horse is shown in semi-rocking gallop, with one rear leg extended forward. 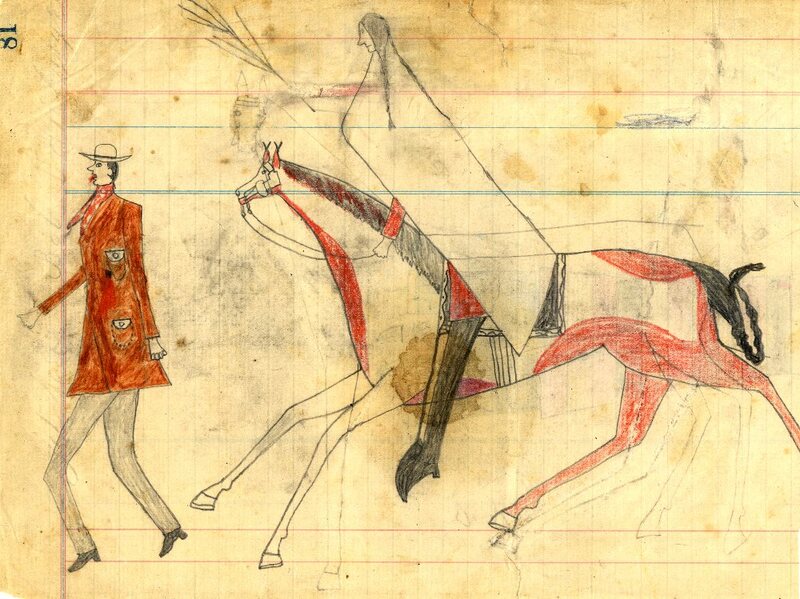 Among Plains Indians, counting coup was an individual act of honor and bravery involving risk of injury or death; such feats were recounted in story or memorialized in ledger drawings such as this one. TARL Archives.